Thanks to my new friend, Heather (maker of the cutest jewelry!) 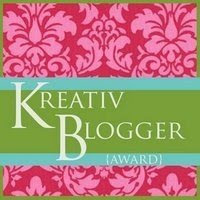 for nominating me for a Kreativ Blogger award! 6. Post links to the blogs you nominate. 1.) I am 5 feet 11 inches tall. Love being tall, but not taller than EVERYONE when I enter a room. I get asked "How tall are you, anyway?" about 50 times every time I go out. 2.) 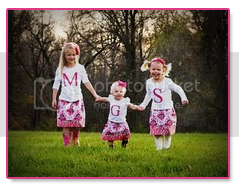 I have 3 sisters, and LOVE it. Two are twins, Adie and Haley and they are now 27. I am the oldest, 30. And the youngest, Maggie, is 21. Maggie and I call ourselves the "other twins." 4.) My maiden name is VIEFHAUS. That is where the HAUS in Haus of Girls comes from. Very German family background. 5.) I played Softball, Basketball and Track throughout high school. HORRIFIC at Basketball even though I am almost 6 feet tall! Got a softball scholarship to Southern Illinois University at Carbondale and loved every minute of it. Guess who joined me there my senior year? My twin sisters Adie & Haley! So excited I got to play with them again, just like we did in high school. Our lineup was one, two , three HAUS! 6.) After college, I worked as a Private Investigator for five years. I saw the craziest, most unbelievable stuff. I loved it. We followed cheating husbands & wives, served divorce papers, followed the people who filed worker's compensation claims, took pictures of vehicle accident sites, background checks and so much more. It was such a great job, but it had crazy hours at times. Going from two children to three got a little too hectic so now I am home with my crazy girls! Thanks again for this award Heather!! My maiden name is Verhoff, also VERY german! Verhoff is what I was called in sports my entire life. I wasn't planning to change my name when I got married but Case was a really nice upgrade. Anyway when I was trying to decide whether or not to change my name, I walked around saying it like "Dr Laura Case" and "Laura Case, PI." I told my husband I would only change my name if he would refer to me as Laura Case,PI. Anyway when we exchanged wedding gifts, Jon got me a magnifying lens with Laura Case PI engraved on it. So I was SUPER DUPER excited to read that you used to be a PI for real!! I *love* reading random facts about people!! My maiden name is Wendt and half of my dad's family pronounces it with a "V" - way German! How cool that you were a PI! Fun, fun!! these were SO fun to read! I love random facts about people. We have stuff in common! I am also tall (5'9"), went to college on a scholarship (soccer) at University of Colorado, and I have 2 sisters. That is SO neat you were a PI! congrats! Just found your blog and love it!!! love your etsy store too!!! Thanks so much for the blog award! I love the pics of your adorable family! Girls are the bestest! Have you read the Spellman Files by Lisa Lutz? They are about a young PI and her family of PI's. They are the funniest books ever! p.s. I am following your cute blog now!